You, probably, faced with this situation at least once: WiFi or the Internet connection disappeared for technical or other reasons, and you are covered by a banal misunderstanding – what to do? We offer you to play free offline racing games on Android. Download your favorite game on your phone or tablet and spend an exciting time in any conditions! In the Traffic Racer, you are allowed to do everything on the road that your heart desires – to overtake the oncoming cars, to choose the route and plan of action right on the road, and even to receive money for outstanding results! Of course, repeating this in real life is like death, but on a virtual road, always possible! Traffic Racer is still quite a simple racing game. The goal of the game is simply to overtake cars that are on your way. When overtaking cars at high speed, you get points. The interest of the game is that it is possible to buy new cars or update the garage that you’ve already have, for the money that you get by participating in races. The game is presented in 4 modes: Endless (one way), Endless (twin way), Timetrial and Freeride. In Timetrial mode, there is an opportunity to continue the race even after the accident, so it is the most profitable for earning points. Next, there is the choice of location – first, only two are available, but later, after earning a little money, you will be able to open a few more. 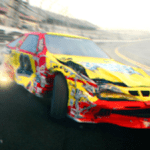 This game has a 3D effect, shocking sound effects, cars are presented in a realistic form. Crazy for Speed – the most dangerous race around the world, from the sharp slopes of the Alps and ending with deserts and a city on the water – Venice. Only speed and drive, on each stretch of the road. Sit behind the wheel of the fastest car and rush to the finish line at full speed, ahead of all on your way and overcoming the most unexpected and difficult obstacles. Various supercars from around the world and automotive monsters will be on the same starting line together and a grand race will begin that will simply capture the spirit of the player. There are no speed limits: the whole world – one big track, where only an experienced and cold-blooded racer can collect dozens of trophies. Try to make this driver you! Challenge the players from all over the world and show that you are the coolest and most driving racer on the whole planet that can outrun anyone who can only look at your car. Choose a car from the presented in the game from world-famous manufacturers and improve it in your garage. Paint your car in any color, install a nitro accelerator on it and carefully prepare for the race. Crazy for Speed has a cool graphics and indescribably cool physics, which is very cool and will immerse you in the gameplay. Be always ahead and do not look back, because this is the main rule of the rider! Hill Climb Racing is another game for your smartphone, in which you can appreciate modern virtual physics. The main hero of the game is Bill Newton, who wants to conquer the hills and mountains in his SUV, regardless of the environment. A lot of unique locations with their conditions will test the strength of your vehicle. Perform complicated acrobatic stunts, get money for them, modify the car and set new records. Together with Bill, you will ride through the countryside, the desert, the snow-covered expanses of the Arctic and even visit the moon! Each of the zones has first-class graphics, and the complexity of the tracks is constantly increasing. But do not overturn the car – Bill’s neck will not stand it. Once Bill will even have to ride a tank, sticking his head out of the hatch. Of course, the driver wears a helmet, but even it does not save in those cases when a multiton car lands on his head. Therefore, it is necessary to balance gas and brake as skillfully as possible, so that the car maintains its balance. 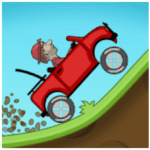 However, the risk in Hill Climb Racing is also encouraged. For doing tricks, gold coins are given in very large quantities. They should be spent between the races to upgrade the car. Without tuning you can not go far. Download Hill Climb Racing on Android is recommended for everyone who likes these games, which require attentiveness and exact action. It will interest you for a long time because locations periodically change. If Bill starts his race on quite familiar hills, then the most interesting part of his extreme trip will be on the Moon! With its reduced gravity, jumps will look especially fascinating. 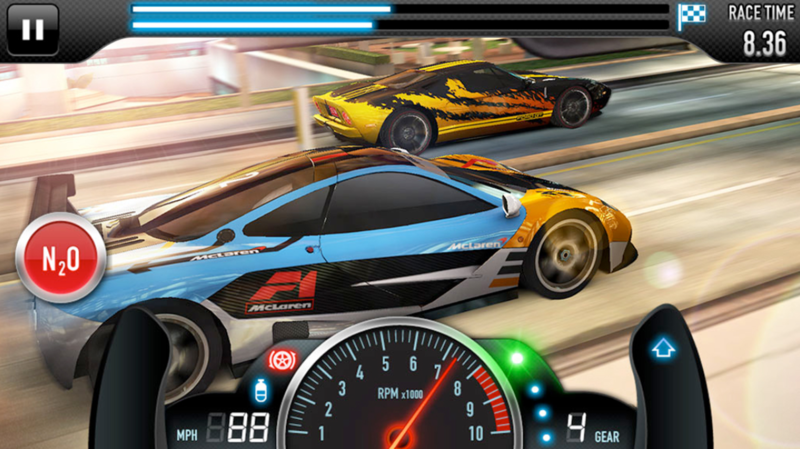 Asphalt 8: Airborne for Android is the most famous competitor among all other representatives of the genre. This is truly a genius arcade. Stunning physics based on the latest engine, amazing tricks at high speeds and, of course, intense competition with professional racers – this is the eighth of the most popular race! The developers have prepared for you 47 high-speed cars, 80% of which are absolutely new cars. In the list of cars available for piloting, there are the most popular models of famous brands: Bugatti Veyron, Lamborghini, Pagani Zonda R, Ferrari FXX. Each of them looks and sounds no worse than real ones – the creators of the game made everything that you felt like driving a real car. You are waiting for dozens of trails in the most picturesque corners of the planet: Iceland, Venice, French Guiana, Nevada. Local routes are not only flat asphalt and steep turns, but scattered springboards, allowing to fly in the air and perform insane tricks. Career mode includes 8 seasons and 180 events – constant action will not let you get bored and smoothly transfer from race to race. In addition to building a professional rider’s career, you can play in the new modes “Infection” and “Drift”. And for those who are interested in competing with real people, the developers have realized multiplayer, in which on one track eight riders can compete at once. You will be able to take the top positions in the leaderboard! Try! For a long time you dreamed of destroying a couple of beautiful and fast cars ?! Then you definitely should try a new game in the genre of derby called Extreme Gear: Demolition Arena for Android. You will have such a chance, and your opponents will be not only virtual but also real players from around the world. To diversify the game process, developers have added a couple of modes to the game and apart from a standard career, you can try your own forces in multiplayer mode, competing with real players and getting more experience points and monetary reward for it. All this will allow you to get access to a new faster car, and also improve the main technical characteristics of your car, which will make you faster and stronger at the same time. The management is simple, and you can always change it in the game settings. The most convenient is the control with arrows and a pair of buttons. 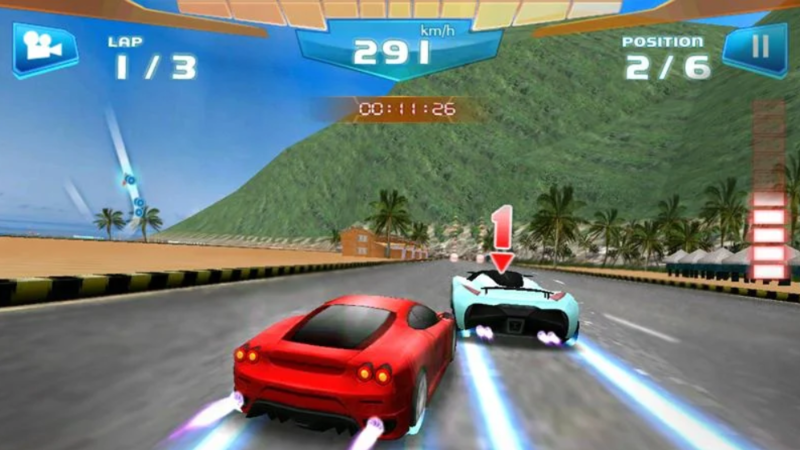 During the race, the car will receive damage that is displayed in the lower left corner and if they are critical, you will simply lose the car and continue playing with the new car and so on every time. Extreme Gear: Demolition Arena – a good derby-race, which can be played both on the road, and sitting at home on the couch, fighting random players from the network. EcoDriver is an unusual racing arcade dedicated to the problems of modern ecology: to remind of the harmful effects of industrial fuel and a gasoline, a tiny electric car will be needed. “The main character” moves smoothly around the locations, collects coins and tries not to get into unexpected situations. And on the way, there are traps and charging constantly ends. Controls and rules. In EcoDriver for Android, you will understand how to deal with the control buttons and memorize the basic rules in just a few minutes. If there are problems with the passage, then the virtual assistant always fastly prompts and cheers, say, any changes are always important, especially getting hard work. In general, the game mechanics in EcoDriver is made according to the classical scheme, your task is driving the car to try to overcome the maximum possible distance while collecting coins and setting various records. The player is put in conditions of the total economy. The problem of economical driving does not mean that you need to go slowly – rather, smoothly and efficiently. Locations and ratings. Download EcoDriver on Android is recommended to all lovers of all the strange, serious and casual – dozens of generated levels, nice scenery, an interesting way to visualize the picture. In general, the project perfectly copes with the task. If you are ready to feel yourself drag racer and drive through city streets, leaving behind all the rivals, then this game is just for you. If the spirit of the competition is something that you want to feel, and you are ready to practice in the mastery of crazy driving cars, then jump behind the wheel right now! Racing for speed or competition – choose what you prefer and go forward, for the first place in the leaderboard! At your service, there are more than eighty dozen licensed cars and those that you could only dream of in real life. Do you want to drive Ferrari, or do you want to choose Aston Martin or McLaren … And maybe you like Bugatti or Hennessy? The main thing is how to hit the gas properly. Otherwise, the best CSR players will bypass you. The award for the victory in the world tour will be elite cars. And if you win in the boss race, you will become a real king of the streets. Do not forget to improve your car, tune it to your taste – you are given a lot of opportunities. Unique color and number – and now your car does not look like any other, and you are ready to win it! Big Bang Racing is a classic motorcycle arcade with unusual levels and pleasant control: here is fighting against real enemies and a level generator. Before the start – the traditional training: study the interface and the main keys of control, the implementation of the first simple tricks, buying improvements. And then the first passed level, awards, and a lot of impressions. Obstacles that occur along the way can have different forms. For example, a ruined bridge, a pile of stones or an island in the air. If an alien passes a selected distance, he moves to a new level. On the way, he can collect bonuses, which will help to buy useful accessories. In addition to the proposed routes, you can build your own, from the proposed elements. Control and graphics. All the main functions and buttons for speed and turning the vehicle for a successful landing are on the screen. In principle, even a beginner is unlikely to be surprised by the control system – everything is available and convenient. With graphics, too, everything is successful – cartoonish, detailed and cute. It lacks some special effects at certain moments. Modes and awards. In Big Bang Racing, you can compete both with real rivals and with computer opponents. The levels prepared by developers hardly differ in variety. The gladiatorial arena, full of obstacles and with concrete fences, is surrounded by a line of fans’ stands – all spots are full and cheering fans are waiting for a spectacular show. Gladiators will be trucks and cross-country vehicles, Formula 1 cars and expensive sports cars. Drive Ahead surprises with its variety of vehicles, which will need to be controlled by the user. The player will need to show his driving ability from the excavator to racing cars. These races can really be called survival races. The goal of the game is not just to go through the track, but, overcoming the difficulties on its way, destroy opponent’s vehicle. As the trails pass, you can collect several cars, as well as take the top position in the leaderboard. The game is represented in a pixel graphic, which gives it even greater severity. Arcade Drive Ahead! has several modes with regulated rules – you can, for example, update the gladiator arenas and add obstacles; or activate the “Sudden Death” mode with new threats: like flying traps and activated blades. The tuning system, unfortunately, does not work on cars – cars are not allowed to be improved or changed, you can get them when playing in the casino. Drive Ahead! – arcade with a prohibitive level of entertainment and vigor. Real Racing 3 is the third part of the popular race from Electronic Arts for Android. This time the game has a fundamental difference from previous versions because it is absolutely free … although you can make many purchases in the game. Sit behind the wheel of a high-speed car in another part of one of the best racing games of Real Racing 3. Developers have once again modified the graphics and physics of the game. You will have a choice of 45 real cars, each of which is unique in its own way. The cars are stunningly detailed. To this realism, it should be added that all presented models of cars are actually existing, and they are easy to recognize. The game is also interesting because 22 riders participate in the race together with you. So in order to take the first place, you will have to try really well. Demonstrate your skills as a rider can be both in single-player career, and in multiplayer. Buy new cars, new parts for them and come to the finish line only first. This will allow you to become the best racer in the world! Racing arcades from the studio Ubisoft Entertainment made in an impeccable style with sophisticated graphics, thoughtful locations and really complex levels require the ideal passage and concentration. The original plot and realistic physics with colorful special effects make this game a mix of different genres rather than banal races. And the main character instead of a professional motocross fighter will be a village guy on a motorcycle, which now and then threatens to fall apart. Within a few seconds, the new player will learn how to drive a motorcycle, overcome various obstacles and successfully reach the finish line. However, even the most skillful rider will not be able to avoid blockage of stones in the cave, which awaits us at the end of the training regime. However, it is not necessary to be upset. This event is part of the storyline and a kind of starting point for a new life. Players will find themselves on the dusty streets of an abandoned town. In such conditions, players will receive the first tasks, and at the same time get acquainted with the characters in action. You will perform tasks near the city in a large canyon. In such conditions, players will be able to demonstrate master class, jumping over obstacles, gaining incredible speed and conquering one mountain after another. Control, in this case, will depend only on a pair of buttons that are placed directly on the screen. In the game, there are more than 200 missions. We are waiting for 9 different motorcycles with unique variants of improvements, 10 different types of terrain, 70 unique tracks and more than 50 hours of gameplay. Perhaps, it is the visual component of the game that impresses the most. The remarkable detail of the image of the protagonist and his motorcycle, realistic physics, sound accompaniment – all this does not give rest and beckons to the passage of the next chapter. The game allows not only to compete with “artificial intelligence”, but also compete with real players in multiplayer mode. Death Moto 4 is the legend of a fearless warrior of roads, who decided to clear the apocalyptic wastelands from evil and injustice: the hero hides his face behind a steel helmet, uses a steel bat and constantly changes his motorcycles. 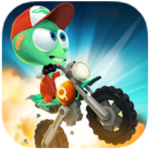 The rider copes with the task with a moderate speed, and yet help is nee – click to download Death Moto 4 on Android and try not to slow down when doing a vital mission! 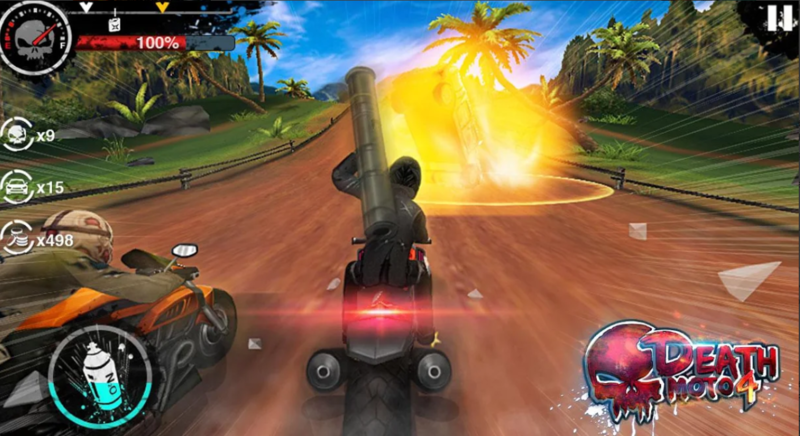 In Death Moto 4, you will meet with rivals almost uninterruptedly – and they come from different directions, sometimes appear directly on the road, and sometimes there is a whole convoy. You can deal with every enemy simply pressing on the screen, then the main character will get a mighty bat and will overcome even the boss. But it is worth controlling two important factors – the amount of vitality and fuel. If both elements approach zero, the game will end. As for graphics, Death Moto 4 is not the best, but the game has good models of motorcycles and some really well-created special effects. Models of racers are carefully executed, and the way of generation of the environment during the game provides a realistic sense of speed. 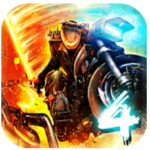 Death Moto 4 шы an exciting game, superior to the previous release in all respects. You can unlock a lot of various improvements, use more than a dozen different outfits for your racers, and use a bunch of dangerous weapons. This version of beach racing will especially appeal to the crazy drivers for whom there are no rules. And those who yearn for the tropical islands, the blue sea, palm trees, and seagulls. In short, all in one very attractive game called Beach Buggy Racing. 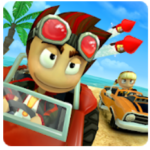 Bright cartoon graphics, sandy beaches, paths among the jungle, city streets … The game is very attractive and fun, especially as you can do everything as a racer. The goal of the game is to start and be the first at the finish. Competitors can be eliminated in any way – to overtake to the right and left, push off the track, make traps and even shoot down missiles. You may not have any driving skills, all you need is an audacity and a thirst for victory. On the road, there is rubbish, which can be of use to you (various gadgets for dealing with rivals). However, in these boxes, there are also quite unpleasant things that not only will not help you but will even harm you. In particular, a crazed chicken can fly out of the box, spreading feathers and closing the view. So be careful not to fall into your own trap. Perhaps, it is better to buy means to eliminate leaders at a roadside store. In addition, the seagulls and crabs walk along the beaches, they may be on your way at the most unexpected moment. It seems that they shouldn’t be dangerous, but you should not face them anyway, because you will certainly fly off the car. Each of the 12 tracks is a separate level. But to get to the next, you need to complete the previous one and earn the stars. If this doesn’t work, then the race begins anew. Various bonuses can be earned, or you can win them in the lottery. The money can be used to upgrade your car. In general, race on the beaches will give you a sea of adrenaline and good mood. Racing arcade from the studio GamYO! is gradually gaining popularity, thanks to the unique control features – to become a champion with thumb in portrait mode. Using just one finger, players will be able to achieve spectacular maneuvers on the track, such as controlled drifts, sharp turns and even turbo accelerations on straight sections of the road. But in Thumb Car Racing there are about 120 tracks and 40 cars to choose from, are they ready to challenge the champions? Racing in the Thumb Car Racing develops by standard rules – ten members, a regular track in several circles, gold coins scattered at the level and the finish line determining the winner. To receive cash awards, you have to cross the finish line first. The easiest way to do this is using special accelerators available for purchase in the main menu. Gradually you will open new racing cars and accelerators, go from one tournament to another and gain the reputation of an invincible driver – just download Thumb Car Racing for Android and the competition will begin! And remember, a computer opponent can always be tricked! You will experience unforgettable emotions and unforgettable feelings of victory. Thumb Car Racing is an interesting race with good graphics and simple controls. In this racing game, you have to sit behind the wheel of a motorcycle and try to overcome fairly busy traffic routes for a minimum amount of time. First and foremost, the game captivates with its perfect graphics, developers have incredibly fine-tuned locations, as well as very realistically modeled sixteen kinds of motorcycles. Of course, at the very beginning you will have to play on the most simple device, but passing level after level you can earn money and improve its parameters, and when there is a lot of money, you can think about buying the next, more interesting and powerful motorcycle. After choosing the vehicle you have to choose a game mode: race, police, daily race, free ride, multi-user driving and private mode. For the offline game, the race and the police modes will be the coolest. The daily race and free ride are suitable for training, but in multiplayer mode, you can compete in coolness with real players from around the world. In private mode, the player can independently set various parameters, for example, the number of cars on the road, the weather conditions, the speed of movement of cars and even the number of policemen, and then it’s all a matter of passing and winning. You will play in four different locations, each one of different complexity and graphic design. After winning all the races you meet with the boss, that is, four different regions are equal to four formidable bosses. For convenience, four control options have been added to the game, you can adjust it to your preferences, but the most convenient is the standard, where on the right there is a gas pedal, and the brake on the left, and the control is carried out using slopes. During the ride, the acceleration will be available, you can ride even on the rear wheel. Also, to make the game more enjoyable, you can change the camera angle and ride from different views, it looks very interesting. The graphics in the game are cool, there are different seasons and different weather conditions. The application for Android Asphalt Nitro will give you the unspeakable pleasure of driving super-expensive cars: the best cars ever created will open in all its beauty and power. Races can take place in several modes. The Asphalt Nitro racing project pleases with a single company divided into missions of varying complexity – the routes are in the Alps, China, Brazil, the USA and Iceland, and the tasks vary depending on conditions. The other modes are selected in the main menu and configured manually along with the weather conditions, try it! In total, 10 cars of five classes are represented in the game. You can improve your car for high-quality and fast-riding points. External tuning is limited: only the body color can be changed, and internal modifications can relate to the time of maximum acceleration, the fastest speed and the other. The sound accompaniment is not impressive. You can control the car with the accelerator, steering wheel, and buttons. In a word, if you are looking for a thrill – drive the race car! Have you dreamed of driving a real sports car? Your dream will come true after installing the Fast Racing application for Android. Fast Racing is a race that has a dozen different levels and tracks and a very powerful campaign mode. Once you have passed the next level, you can improve and tune your car. You will be able to change everything in your car, from color to different engine parts, to make it even more powerful. Winning in the race, you, of course, will receive money. With this money, you can not only upgrade your car, but also buy new ones. In the end, you will have a large garage with a wide variety of cars. 48 levels in career mode and four modes for a fast race. Management in this game can be configured – you can control both with the accelerometer, and using the touch buttons. The first option is usually a little more complicated, but it’s worth getting used to, and you will understand that it is more accurate. Fast Racing is a very interesting 3D race in which players can compete on the track day and night, in the busy city center or on the outskirts.